IT TAKES about 10,000 hours of practice for violinists to enter the ranks of top performers by their early twenties. If you want to get good at anything, you need to do it a few times, and that goes for work-life balance too. You need to devote regular attention to it, because it’s something that doesn’t happen by itself. Work happens. That’s the default. Sitting in a park at lunch with your shoes off or attending a child's school play is not. As we learn in my work-life balance employee training, a more gratifying work-life requires proaction—concerted effort and design, consistent use, and frequent assessment to stay on the path. Balance means that important things in life—family, friends, health, me-time—aren’t being neglected because of a single-minded attention to the task side of the work-life hyphen. It’s a regular check-in with your values and priorities, examining how you’re working and why. In an always-on world, performance will override all unless checks and balance become a daily ritual, like brushing your teeth. Some throw up their hands and say, No, work-life balance isn’t possible. You are never going to get to an exact 50-50 work-life arrangement. That’s not the goal. The objective is managing demands and obtaining the flexibility to feel like you have time for life and family needs. Managing stress is about perceived control over events. It’s the same for work-life balance. It’s felt control over life, not a specific percentage; that is the mission. What parts of life do you need to feel are more under control? Health and exercise? Time with kids? An evening each week for a hobby? What amount of time per week for each of those would help give you a sense that the life side isn’t shunted aside and that you are present for your life and those around you? • Remote working. Being able to work from home one day or a couple days per week reduces commuting time and has been shown in studies to result in higher productivity than a day at the office. • Flexible schedules. Changing start and stop times can be a big help for parents, people caught in commuter hell, non-early risers, and everyone who likes to feel they have more control over their schedules. First Tennessee Bank found that its most productive branches were the happiest. What was making them happy? Flexible hours, the ability to change schedules. The company spread the flex program throughout the company. Earnings increased from $.70 to $1.10 in three years, and customer retention soared from 88% to 95%. • Compressed workweek. Completing your work in a shorter workweek, say, four days, can open up more space for life. Salespeople the world over smile when they hear terms like “no” or “company policy.” They know the reality—that policies are pliable, and, with the right evidence and persistence, beliefs cast in concrete can change to meet the reassessed needs of the policy-setter. A little perseverance can go a long way to forging a better balance. The key to a work-life status more to your liking is you have to propose an adjustment of some kind. Unless your employer knows what you want, you can’t get it. Negotiating for your balance goal is simply the process of advancing a better way to get something accomplished. Don’t let fear keep you going down the unbalanced track. Fear holds your current life hostage to a future projection. It’s interesting to note that the people least likely to take risks are those who place a high value on future time. In other words, the more you’re run by what doesn’t exist, the less you can create opportunities that do. Schedule a meeting or send a written proposal and put your idea out there. First, you’ll need to do your homework, analyzing the boss’s needs and bringing along solutions, including backup plans if you don’t get your first choice. Conduct the pitch in a way that demonstrates you’ve done some thinking about the issue and its impact on the company. Remind yourself that you’ve done your job well and that you can do it better and take care of your personal responsibilities with an adjustment to work practices. Before you introduce your proposal, see if anyone else has done what you’re thinking. Precedents work. If you can’t find one at your company, then look outside to another firm that may have done what you propose. Cite companies such as SAS Institute and Deloitte. The latter company saved $100 million and 700 jobs through a work-life initiative focused on flexible schedules. Describe how the companies on Fortune’s Top 100 Best Companies to Work For list have double the annual profits of the S&P 500. • Update how much you’re doing and accomplishing. Chances are good your manager doesn’t know how much you are really doing. Detail the work you’ve done, the commitment you’ve shown and enthusiasm for the job. • Introduce your issue as a challenge impacting performance. You want to do the best, but there’s an obstacle to working effectively. • Provide an energetic illustration of the challenge. If you don’t have time to see your kids, say so. If you are caught up in chronic stress and have been in and out of doctor’s offices, mention it. Describe the effects of the situation on your responsibilities at home and being able to work in an effective way. • Don’t blame people, blame the issue. How can the work be retooled so you don’t burn out and can take care of your personal responsibilities? • Avoid emotional reactions. Don’t let your emotions trip you up. Never react emotionally. Continue making your points in a firm but professional way. • Have multiple options. Don’t go in with one answer that would easily be shot down. Put together several possible solutions. Be creative. • Be persistent. Most people aren’t persistent enough when negotiating. If the other side doesn’t agree, they move on. Moods and people change. Come back with an adjustment to your proposal. If there is reluctance to go along with your idea, suggest a test case. You can show that it works, and that as a result, your productivity will increase. Empirical evidence is a great springboard to make your idea happen. Set up a trial of your plan. Let's give it a try! Be excited about the potential benefits. Enthusiasm and positive affect are contagious. Use them to build the momentum for an approach that could pave the way, not just for better balance for you, but for colleagues too. 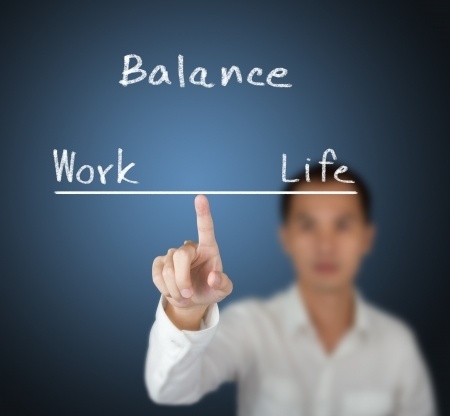 For more work-life details, click the button below to learn about our work-life balance employee training or check out our free consultations on our work-life balance coaching page.